There are many references to ravens in legends and literature. Most of these refer to the widespread common raven. Because of its black plumage, croaking call, and diet, it has long been considered a bird of ill omen and of interest to creators of myths and legends. 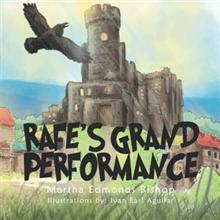 But, in Rafe’s Grand Performance, author Martha Edmonds Bishop depicts a raven whose curiosity leads him to discover great beauty and great danger. He discovers the powers within himself to deal with both. This book tells the story of Rafe, an inquisitive raven who was so curious about the world beyond his nest. He was fascinated by everything he could see in the forest that surrounded him and he wanted to see more. He was curious to see this world of men. Little did he know, he will be mesmerized by the song of a nightingale, the beauty of a peacock and his curiosity will led him to discover his own powers as he sees an advancing army who had come to attack the King’s kingdom. Filled with colorful, vivid illustrations, Rafe’s Grand Performance is a wonderful story in which readers can learn invaluable lessons and somehow draw inspiration from them. It clearly shows that some things considered by many as underrated are sometimes the ones which become truly valuable. As the old saying goes, no one should ever judge a book by its cover. Rafe’s Grand Performance is enrolled in Xlibris’ Bookstore Returnability Program, which gives booksellers the convenient option of returning excess stocks through Ingram Distribution. This book will be featured at the 2012 Book Expo America Book Exhibit in New York, NY, on June 05 - 08, 2012.